Crisis-plagued Greece was thrown into further turmoil on Friday after two members of the far-right Golden Dawn party were shot dead in what police called a “terrorist attack” outside one of the organisation’s offices in Athens. Two men, described as a 20 and 23-year-old, died instantly in the drive-by shooting, according to a statement released by the extremist group. “Two helmeted terrorists on a motorbike stopped in front of Golden Dawn’s offices in [the northern Athens suburb of] Neo Iraklio while the office was open and a lot of people were [gathered around] its entrance,” said the party. 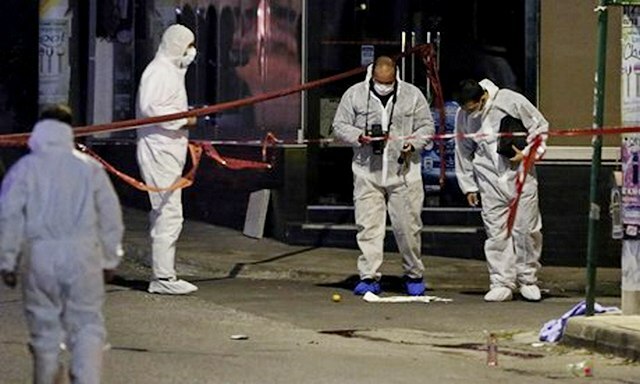 A third Golden Dawn member, identified as a 29-year-old father of one, was fighting for his life in an Athens hospital after being severely injured in the hail of gunfire.